S1 Cain slays Abel. 2 figures. Abel standing. Old Testament. Book of Genesis. E1 Adam and Eve knowing their nakedness. Book of Genesis. Old Testament. Adam and Eve are depicted facing to the front, on either side of the tree of knowledge. The tree's branches form an arcade above their heads. 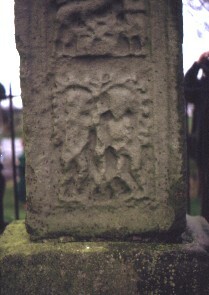 The serpent is entwined around the tree and facing one of the figures, probably Eve.